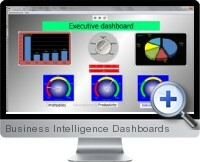 Excel Business Intelligence Dashboards (DashboardPlus) provides flexible tools for efficiently creating executive dashboards and KPI reporting with business intelligence functionalities. Data filtering and variable setting can be employed to undertake risk analysis and data mining analytics. BI reports in Excel can be constructed by linking in underlying data and arranging dashboard reporting components into the interface relevant for the analytical reporting requirements. The business intelligence dashboard reporting is ideal for both analysts and managers that require fast and relevant answers to trends and characteristics of business data for decision making. Independent control area for managing dashboard component settings. Automatic refresh when underlying data changes. Dial and gauge control scales can be customized to suit analysis. Styles can be set for reporting branding with change highlighting, title and background customization. Selector components allow filtering of data by sub category. BI dashboard controls can be copied, moved and resized within the dashboard report. External database data can be used as the source of the business intelligence reporting. Component settings are saved with the Excel file. Exporting supports images and HTML for publishing and distribution. HTML can be automatically generated on change to update web reporting content. Dashboards in Excel can be viewed by anyone within the same organization.